Madison Music Foundry is excited to again offer our class series in live sound and recording techniques. Each class covers a wide variety of topics including micing instruments, mixing tips, troubleshooting, and more! Not only will you learn about the basics in live sound and modern recording but you will have the opportunity to ask professionals the questions that have been on your mind. 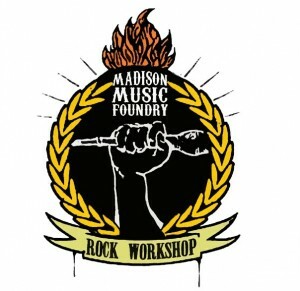 Classes are held at the Madison Music Foundry and on location where you will see actual working sound/recording systems. Take your knowledge and skills to the next level and sign up today! Courses offered separately. Limited space available. Some age restrictions apply. Discounts for current students of the Foundry. Apply by Aug 31 for $25 off! In Rock Workshop everyone is a rock star. Kids and adults get to practice for eight weeks with an instructor, learn three songs, write at least one original, record at professional recording studio Blast House Studios, and play a packed show at Madison’s top rock venue the High Noon Saloon. This program is open to everyone! We’ve had participants drive in from all around southern Wisconsin. Apply by Aug. 31 and receive a $25 discount! Bateria Fundição (bah-teh-REE-yah foon-di-SOW) is Madison Music Foundry’s new Brazilian percussion ensemble. The Bateria is a fun, exciting and high energy performance group that plays the Carnaval music from Brazil. We combine authentic Brazilian drums, singing and choreography to create a truly unique and unforgettable experience for all of our members. Students in grades 8-12 can join, you do not have to be a percussionist to participate! Class meets every other Saturday from 3-5:30pm at Madison Music Foundry. First class is September 15; second class is September 22 and then every other week thereafter (click here to view the calendar). Cost is $36 per month paid directly to the instructor. Must be in grade 8-12. All instruments are provided. To enroll send an email to tjr702@gmail.com. Students can enroll at anytime throughout the year.